A substantial parcel of land over five adjacent titles at Kinka Beach near Yeppoon on the central Queensland coast has been listed for sale on behalf of Receivers and Manager through Ray White Special Projects (Qld). The offering located at Alfred Street & Scenic Highway, Kinka Beach, is being marketed via Expressions of Interest by Andrew Burke and Mark Creevey of Ray White Special Projects (Qld) and Andrew Leech of Ray White Rockhampton. The property is being sold under instructions from William Harris and Anthony Connelly of Receivers and Managers, McGrathNicol. Mr Burke said the opportunity exists to purchase the total land parcel of approximately 170.2ha or individual land titles. “The total land area includes five adjacent titles of approximately 150.4ha, 7.66ha and two 4.047ha parcels,” he said. 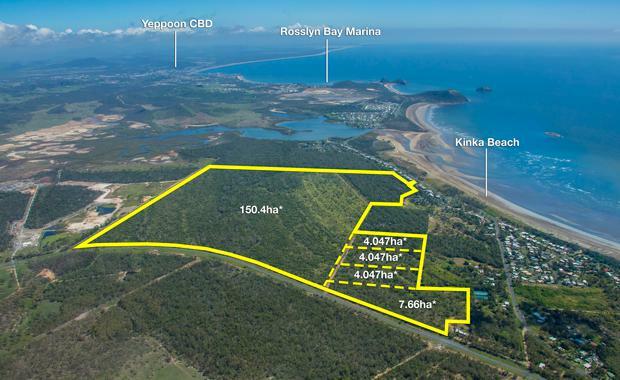 Mr Creevey said the site offers easy access to Kinka Beach on Keppel Bay with convenient connectivity to the City of Rockhampton as well as Emu Park, Yeppoon, Keppel Bay Marina and Great Keppel Island. “Kinka Beach is approximately 40 minutes’ drive from Rockhampton and approximately 15 minutes’ drive south of the seaside town of Yeppoon,” he said. Mr Leech said Kinka Beach is an entirely residential community with some basic retail facilities available at the caravan park and motels. “Existing homes are predominantly modern and close to the scenic beach where Great Keppel Island can be viewed,” he said. close at 4pm (AEST) on Wednesday, April 20, 2016. The Urban Developer is proud to partner with Ray White to deliver this article to you. In doing so, we can continue to publish our free daily news, information, insights and opinion to you, our valued readers.